Citation Information: J Clin Invest. 2017;127(9):3339-3352. https://doi.org/10.1172/JCI93521. Construction and characterization of the FOP-5×A-Luc assay system. (A) Construction of FOP-5×A-Luc-iPSCs. 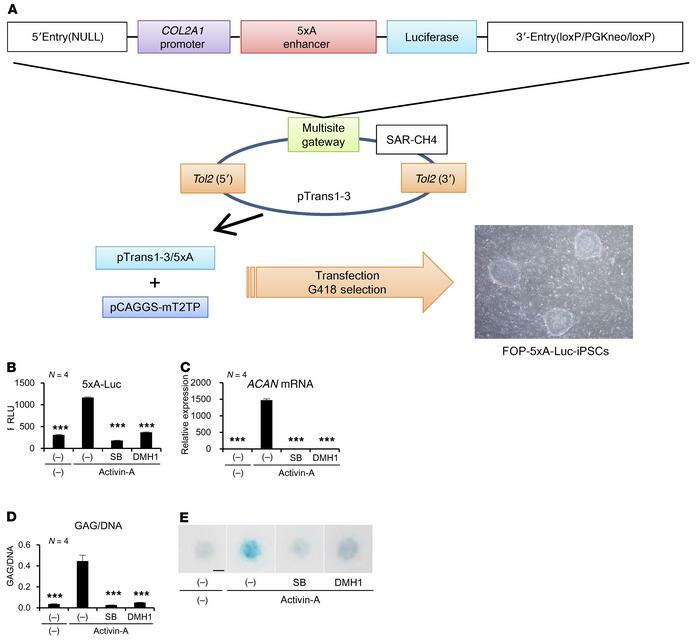 Luciferase, following the COL2A1 promoter and 5-repeats Aggrecan enhancer (5×A), was inserted into the pTrans1-3 vector to produce stably expressing cell lines by using Tol2 transposase from Japanese medaka fish. After cotransfection with pCAGGS-mT2TP (Tol2 transposase expression vector), the neomycin-resistant clone was selected and designated as FOP-5×A-Luc-iPSC. (B–E) Characterization of FOP-5×A-Luc-iMSCs. Luciferase activity (B), Aggrecan (ACAN) expression levels (qPCR analysis) (C), GAG/DNA ratios (D), and Alcian blue staining (E) of 2DCI assays. The cells were harvested 3 days (B), 7 days (C), or 6 days (D and E) after chondrogenesis induction was performed, with or without Activin-A and inhibitors (10 μM). Data represent the mean ± SEM. n = 4 (B–D). ***P < 0.001, by Dunnett’s multiple comparisons t test compared with the DMSO treatment control with Activin-A (B–D).Representative data of n =3. Scale bar: 200 μm (E). SB, SB-43152.